Dr. Creaser obtained his Doctor of Dental Surgery from Dalhousie University in 2006. He received a bachelor’s degree in biology from Acadia University in 2002. On the strength of many glowing recommendations from Dalhousie Faculty of Dentistry instructors Dr. Creaser joined the Halifax Dental Centre in May of 2006. Since then he has been delivering an exceptional level of patient care at the practice. He also served as a part-time faculty member at Dalhousie instructing first-year dental students and supervising third- and fourth-year clinical sessions. His primary focus is on TMJ, Implant and comprehensive esthetic dentistry. Outside of the office Dr. Creaser lives an active lifestyle. He is a long-standing member of the Halifax men’s ultimate frisbee team, which plays a challenging summertime tournament circuit in Boston, Montreal, Ottawa, and other northeastern cities. Dr. Creaser lives in Halifax with his wife Katherine and together they enjoy spending time outdoors whether its skiing or enjoying quiet time in Cape Breton. Practice of complete, quality, predictable dentistry with primary concentrations in occlusion, the temporomandibular joints and comprehensive esthetic restorative dentistry. Dr. Jonathan Logan is a native of Halifax, Nova Scotia. He attended the University of King's College and received a Bachelor of Science in 2006. 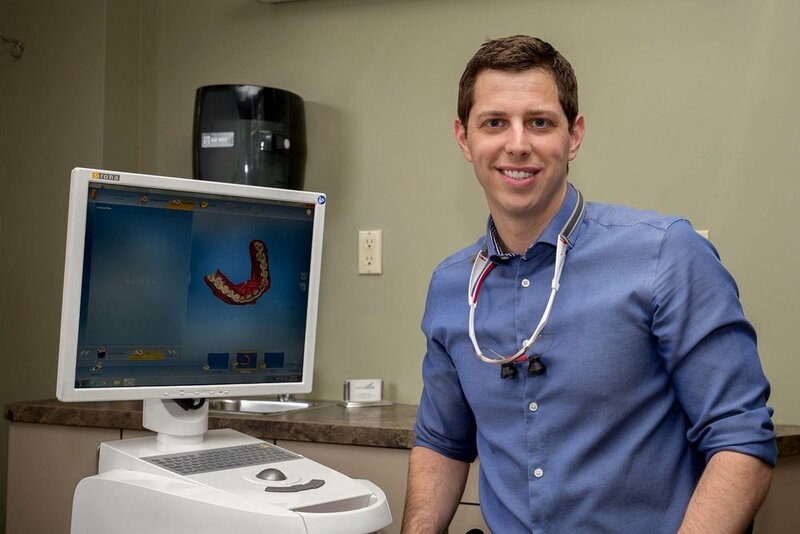 After completing his BSc, Dr. Logan was granted acceptance to Dalhousie Dental School and graduated with a Doctor of Dental Surgery (DDS) in 2010. Since graduation he has spent the majority of time in general practice. Aside from general practice, Dr. Logan has also spent time instructing both pre-clinical and clinical dentistry at Dalhousie Dental School. Dr. Logan thoroughly enjoys staying current with dentistry through continuing education and practices most aspects of general dentistry including clear braces with Invisalign® and same day crowns with CEREC®. Aside from dentistry Dr. Logan also enjoys hiking with his dog, skiing and surfing. Dr. MacNeil is a native of Sydney, Nova Scotia and a founder and senior partner of Halifax Dental Centre. He obtained his Bachelor of Science from Saint Francis Xavier University where he played hockey for the X-Men for four years. In 1994, he received his Doctor of Dental Surgery from Dalhousie University. Upon graduation, Dr. MacNeil accepted an Associate position in a general dental practice in Owen Sound, Ontario. After his two-year commitment, he returned to Halifax to be closer to family. Dr. MacNeil enjoys all aspects of his dental practice with a keen interest in esthetic and implant dentistry. He prides himself on developing lasting relationships with his patients, emphasizing mutual trust and commitment to individual care. His patients and dental team appreciate Dr. MacNeil’s work ethic and professional manner. Dr. MacNeil lives in Halifax with his wife Susan and their two children Emily and Matthew. Outside the dental practice, Dr. MacNeil enjoys: playing hockey, golfing, coaching minor hockey and baseball, is an avid reader and member of St. Benedict's Parish, as well as Saint Catherine's.